Parenting has given his comedy a whole new spin. His popular blog, “Man with A Baby” is read and enjoyed by many, and online sketch comedy pieces with “Grandma’s Favorite” are a Youtube favorite. If you haven’t see him killin’ it on stage, you might have heard Joe on the nationally syndicated “The Bob & Tom Show”. .. or seen him in television appearances on The Tonight Show’s Laugh Squad, “Laughs” on FOX, Gotham Comedy Live, and on the Speed Channel. He’s even had the time to fit in an appearance on the film, “Stand-Up 360”. Joe Larson has an irreverent, intelligent style that gets to appeals to … well…. everybody. He says it’s because he just doesn’t care. The only things he cares about are his wife, his child, his hometown, his new town, his mother, his father, his audience and most importantly making people laugh. 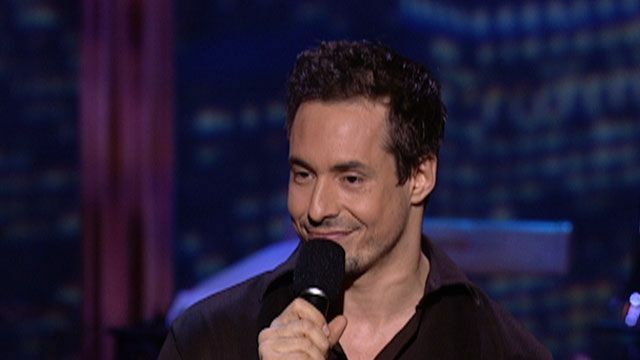 From a colleges to comedy clubs, Joe has been funny everywhere. And he will do his damnedest to continue entertaining the masses. Russ Meneve has been performing comedy in New York for the past 15 years, where he has honed his skills to an edge as sharp as his material. Nowhere was this more evident than on NBC-TV’s “The Tonight Show,” where Russ recently made his second appearance to rave reviews from host Jay Leno and an appreciative studio audience that he had rolling in the aisles. He was recently feature as one of “The Top Ten Funniest New Yorkers You’ve Never Heard Of” by New York Magazine. 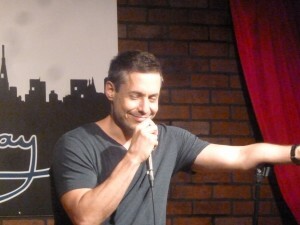 Russ has also been the Lead/Co-Lead/Writer of ten television pilots with NBC, Comedy Central and multiple production companies, co-hosted the XM/Sirius Radio Show, Bad News with Russ Meneve and Robert Kelly, and made multiple appearances on XM’s Opie and Anthony Radio Show and Sirius’ Raw Dog Comedy. Russ has also been prominently featured in New York Times, LA Times, Penthouse/Playbow Magazines and Time Out New York. Catch a live comedy show in NYC tonight!! !